Casa Gallo is located five blocks from the center of town near what locals call “Millionaire Row”. It is a quiet area and an easy, well-lit walk to the center of town. The house offers many amenities and is comfortable and quiet. 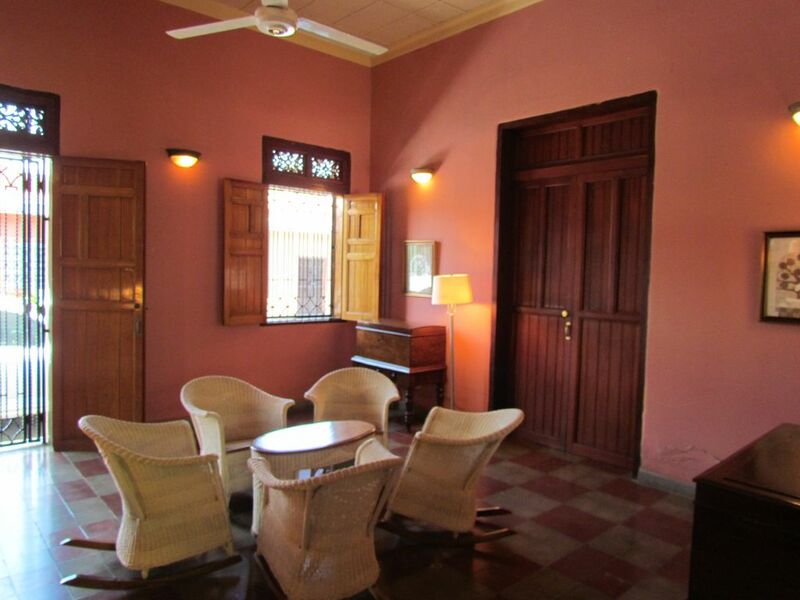 Like all colonial homes, Casa Gallo has an open-air courtyard with a beautiful garden and swimming pool. On the south side of the corridor, you will find the full-size garage and a living area with handwoven wicker rockers, antique furnishings and original artwork. If you have to do a bit of work or just want to catch up with life at home, there is small desk located in the living room perfect for a laptop. Also located on the south end of the corridor is a large Master bedroom with a king bed, air conditioning, ceiling fans and a full shared bath. There is also plenty of built-in closet space for all your belongings. On the west corridor, there are three additional bedrooms. The first has two twin beds, air conditioning, ceiling fan and an entryway leading into the third bedroom which has a queen bed, air conditioning, ceiling fan and antique standing closet. The fourth bedroom has a queen bed, air conditioning, closet, dresser, full bath and entrance onto the poolside patio. On the north corridor you will find a large laundry room complete with a full-size washer and dryer. On the east corridor, Casa Gallo has a fully equipped kitchen with everything you need for a quick snack or full meals for your family and friends, as well as a seating bar area with stools. There is also a dining table for eight and a grouping of beautiful wicker rockers for your comfort. You can enjoy the pool sitting beneath the small covered Gazebo or soak up the sun in the comfortable lounge type chairs located around the pool area. Stairs in the rear of the courtyard lead to a second level balcony with panoramic views of Granada rooftops and Mombacho volcano -- enjoy the cool breezes from the lake. From the rear of this balcony you enter a large covered patio and a beautifully secure private walled garden with fruit trees, bougainvillea, and lawn. A perfect place to enjoy your morning coffee. A Movistar cellular phone is available for guests’ use -- minutes may be purchased at the movistar office across the street. If you are looking for the perfect place to enjoy your time in Granada, a home away from home, Casa Garden is the ideal vacation rental for you and your family.